AD Zero is a stylised Android 4.0 powered smart-phone approximately half the weight of an iPhone, with a larger screen and featuring Ring Flash technology, a ring of LED lights around the camera’s lens to provide even flash distribution when taking photos. 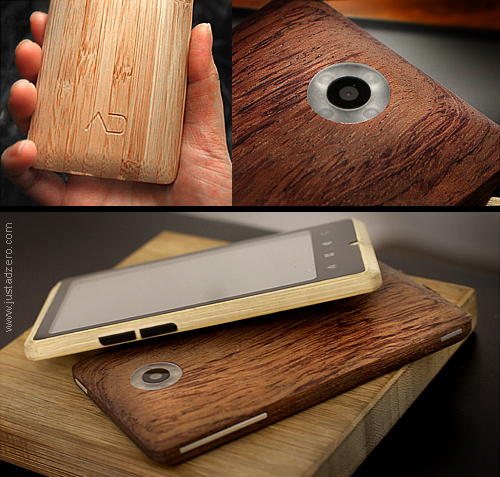 But what really makes it unique is that the phone's casing is sculpted out of a single piece of four-year-old organically grown bamboo that has been treated to make it more durable. After posting his concept online, the UK student on Middlesex’s Product Design course, Mr Kieron-Scott, was contacted by a Chinese technology entrepreneur wanting to make the phone a reality. It was initially intended for the Chinese market, but after receiving an enthusiastic reception at a design show during London Design Week 2011, the company plan on launching the phone internationally.